Are you ready for the next generation of networking? Ethernet is occupying center stage again as the IEEE and vendors release new standards and products governing its deployment. And faster speed isn't the whole story, the advent of Gigabit Wi-Fi is ushering in a new flood of consumer and business devices that has fueled the development of a new breed of switches—2.5 and 5 Gigabit Ethernet (GbE)—that will permit enterprises to extend the life of their existing infrastructure. At the same time, increasing data center demands are forcing companies to assess what they'll need as they migrate to 25, 40 and 100 GbE. Higher speeds means careful attention must be paid to such issues as cooling, power and interfaces. 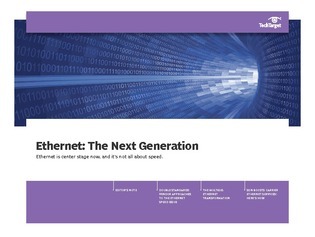 This guide examines the impact that software-defined networking will have on carrier Ethernet. The goal: high-capacity networks capable of delivering a wide variety of services.